We started the day in Wichita, KS. 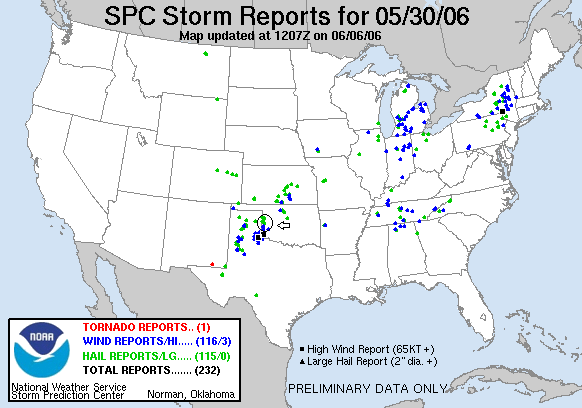 Today’s target was the stalled frontal boundary across Kansas and the Texas panhandle. We pushed west to liberal and picked up the first cell just north of there. The cell went severe but was cut off and died not long after. We then targeted an isolated tail end Charlie cell near to Arnett, OK. Unfortunately we were behind the storm, which had an odd configuration: The anvil was pushing off to the northeast, but storm motion was to the south-southeast. 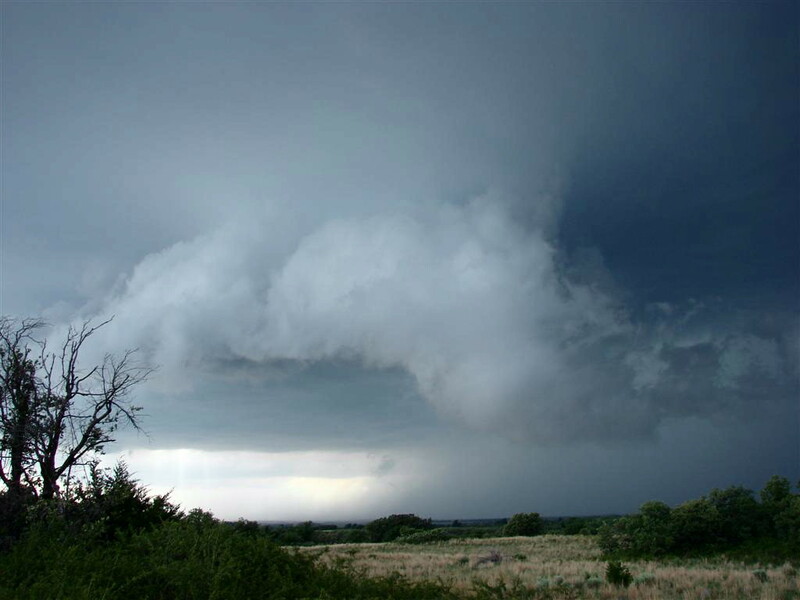 In order to intercept, we decided to core punch the storm despite knowing that it contained very large hail. Luckily we caught only a glancing blow from the core and managed to punch through to the southeast of the precipitation core unscathed. By now the cell was a full blown supercell. 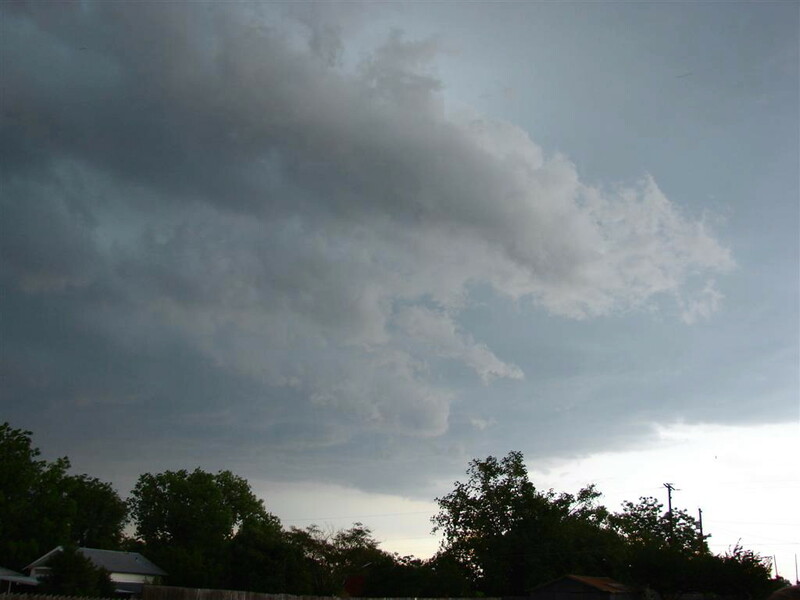 It soon dropped a wall cloud and then a 30 second needle funnel. 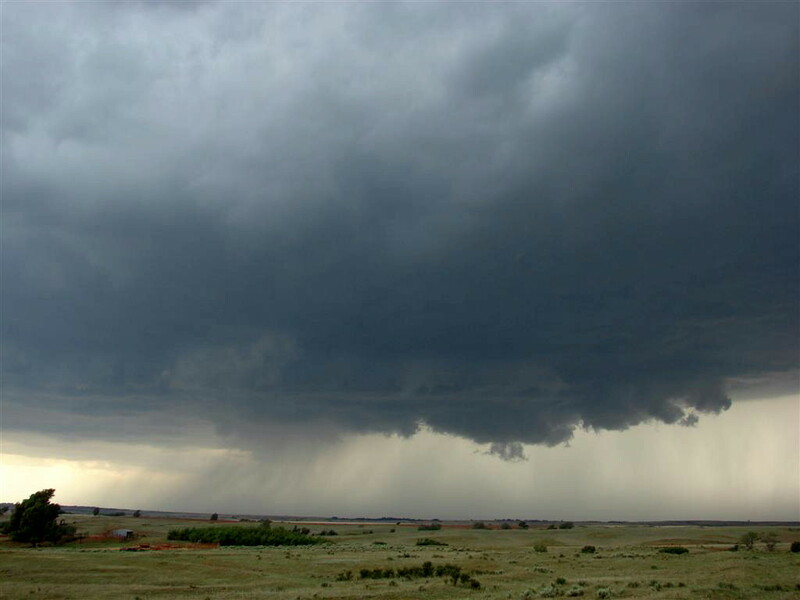 A new cell formed to the south and soon began to merge with the supercell we were chasing. After some positioning we were able to set up right beside a new meso updraft that soon again produced a low wall cloud with rapid rotation. It also had an awesome tail cloud form off the wall cloud. 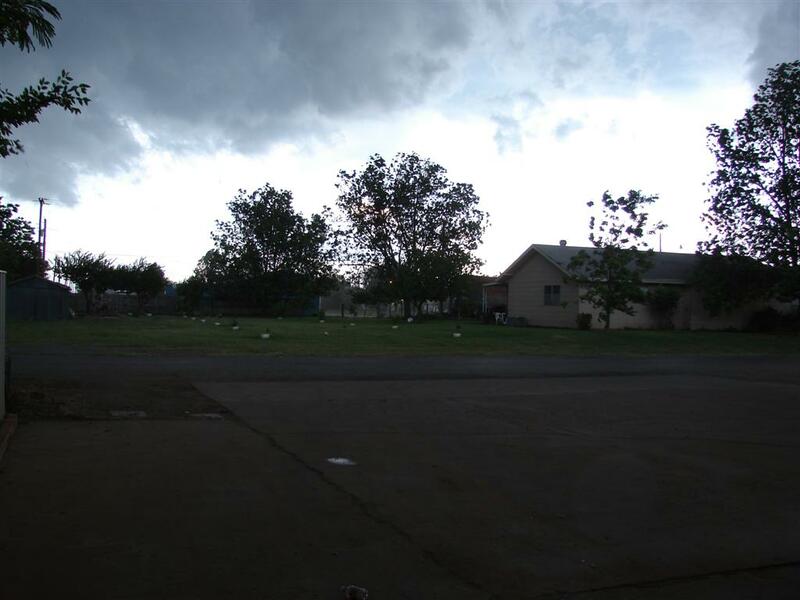 Twice the rotation in the wall cloud tried to focus into a tornado but it was not to be. 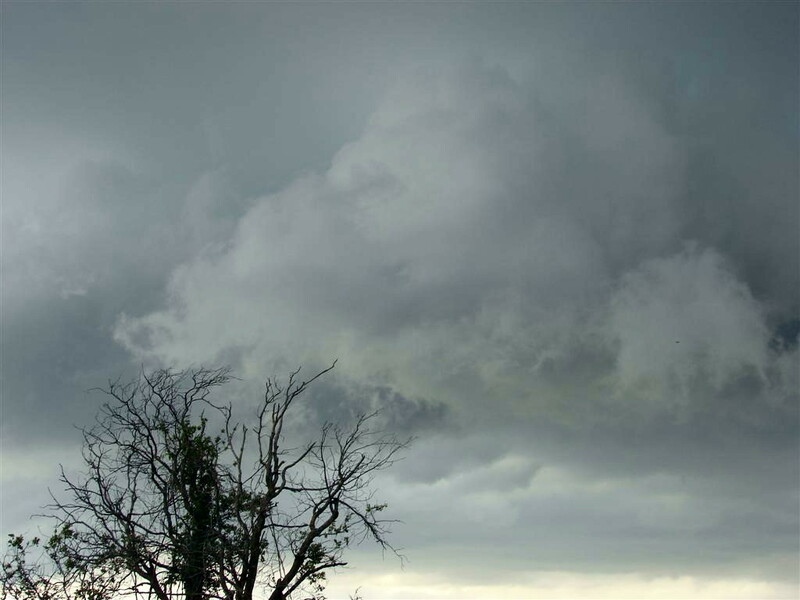 We were actually only 300 – 500 meters away from the wall cloud as it tried to spin up. The wall cloud occluded and the storm started to loose focus, so we moved south as another cell merged into the rapidly growing storm. This time the storm had just barely started to form a lowering before the storm became outflow dominant and really started to hail out. 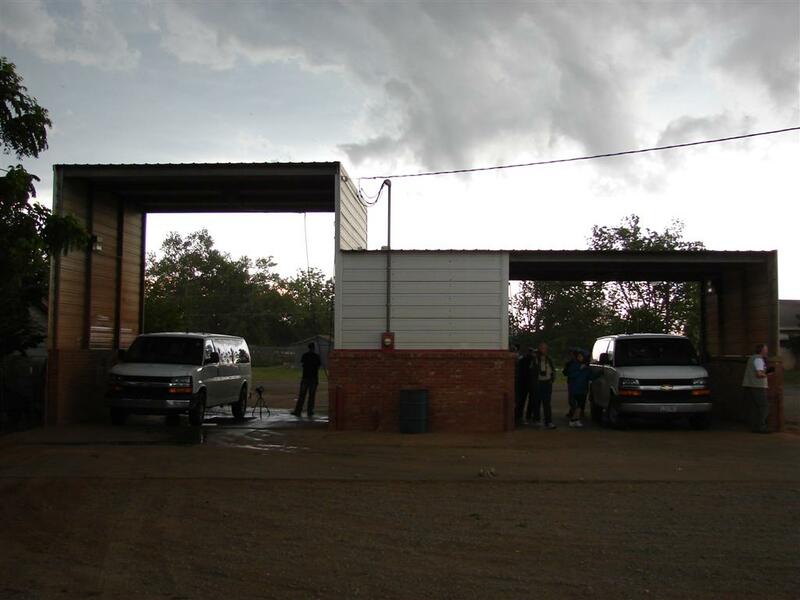 So we blasted to Erick on I40 where we found two empty carwash bays were we parked up the van and allowed the full core of the storm to pass over us. 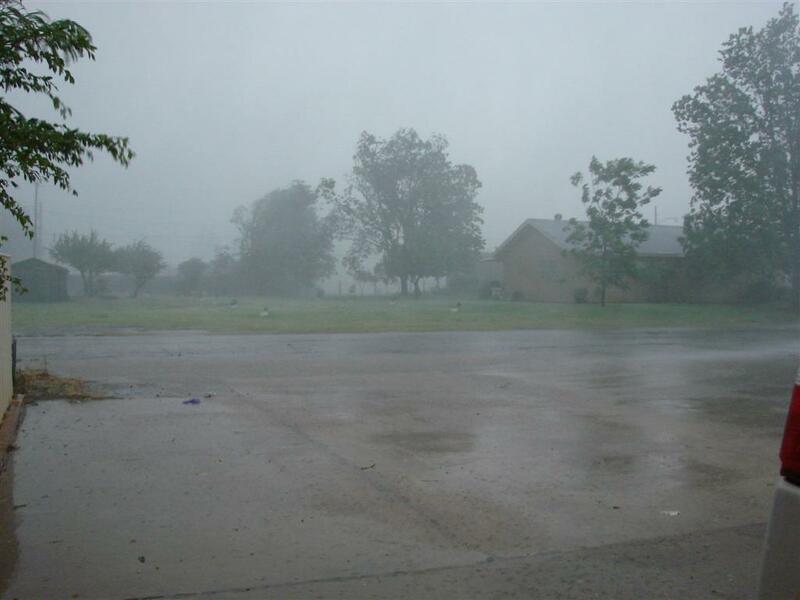 There was a deluge of rain and estimated 60 mph winds, enough to blow down some tree limbs. We didn’t get the big hail however, just a few bursts of pebble sized hail. We had a hard time navigating out of town, then went to a truck stop on I-40 for dinner. When we passed through Erick about 2 hours later it was still absolutely pouring there, the flooding must have been horrendous. The big opportunity for this storm was right after the first cell merger. It did everything but tornado and the wall cloud was cascading so much that I almost couldn't believe it didn't. The storm was just a little too high based for the rotation to get to the ground. We finished up in Liberal, Kansas ready for an upslope Colorado target the next day. Our mileage total for this day was 605 miles. 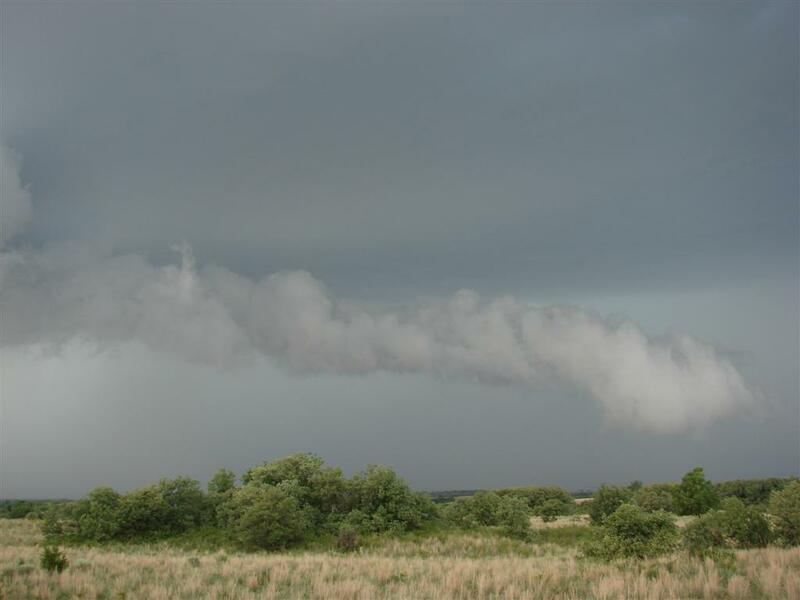 Wall cloud forms with a long spinning tail cloud trailing off to the northeast. Another look. 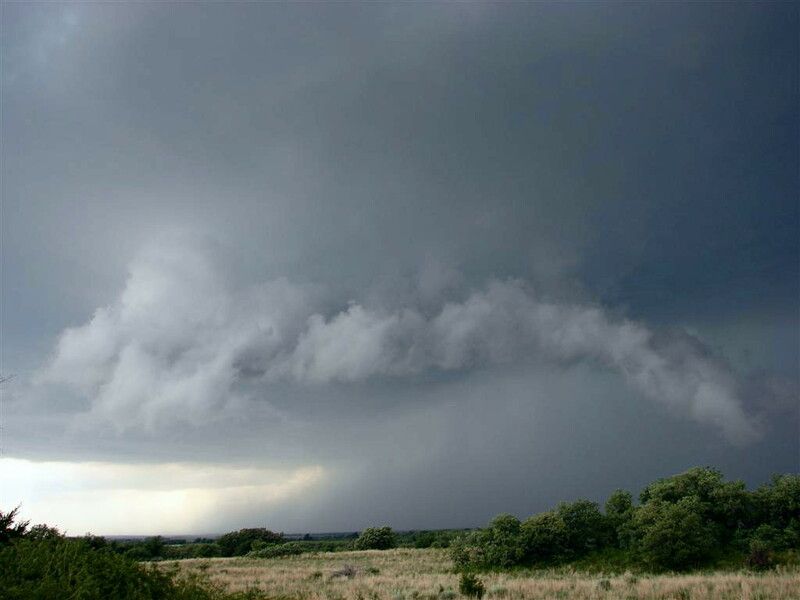 The wall cloud tightens up. As the wall cloud is practically right over us, it's spinning like a top. 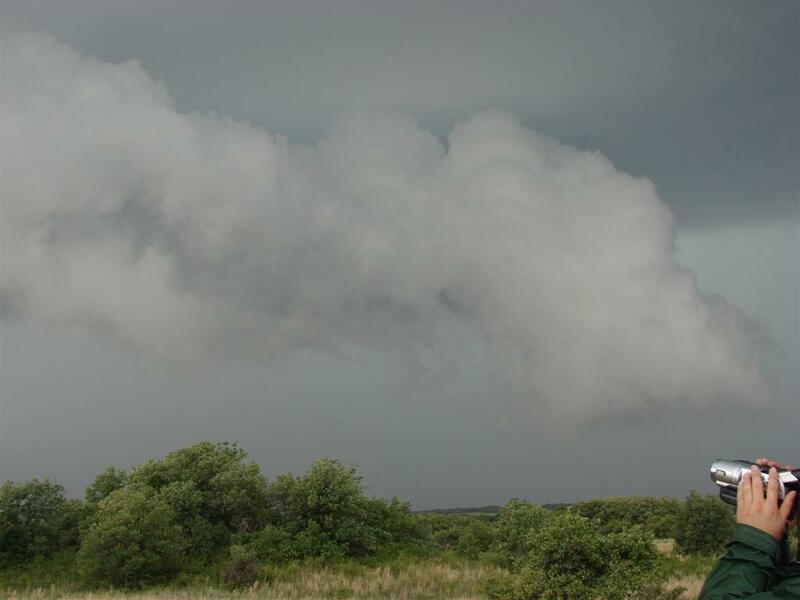 Unfortunately the low level winds were probably too weak to get the rotation to the ground. After the 2nd cell merger, another lowering starts to form. 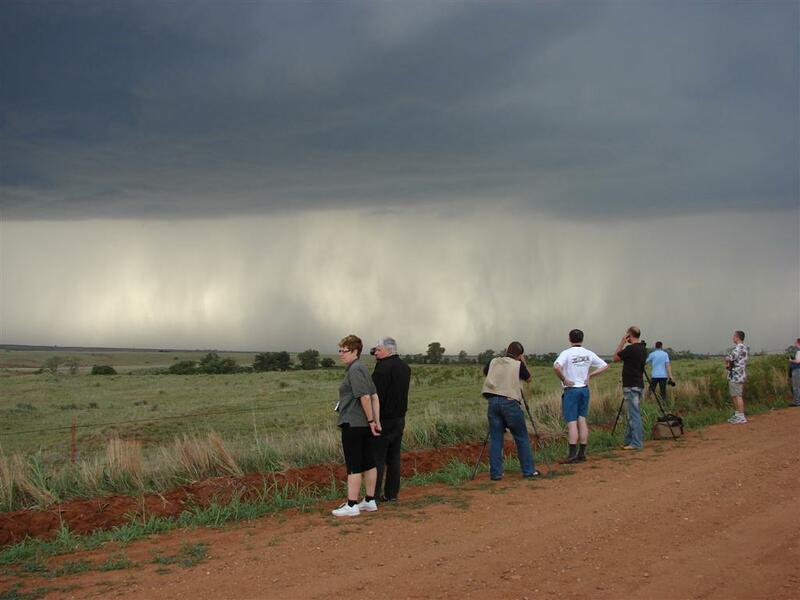 The tour group looks on as the base starts to rain out with impressive rain curtains to our north. Now an outflow dominant HP storm, we race ahead to Erick, OK to try and sample the hail core from the safety of a car wash. Shelf cloud overhead tells us that the core is just about here. Looking east out of the bay of the car wash. The owner was out watering his lawn about 10 minutes before the storm arrived. Are you kidding?? The deluge hits. We didn't quite get the hail core unfortunately, just heavy winds and a total downpour. 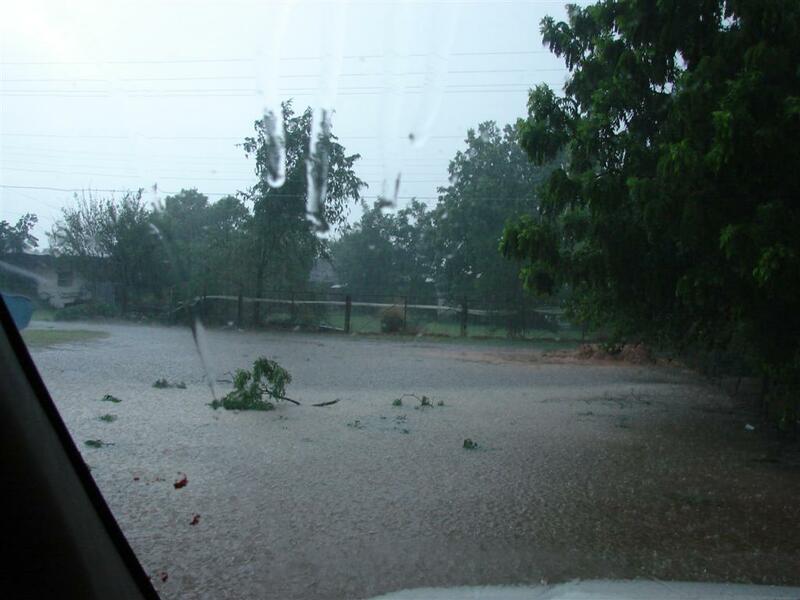 Flooding and debris as the first wave passes by.